EUGENE — There's the curly long hair, which Justin Herbert hints he will cut when he finds the time. There are the biceps, popping out from the sleeves of the quarterback's No. 10 Ducks jersey as evidence that Oregon's offseason strength and conditioning program might turn out to be a game-changer in Eugene. But of all the reasons Herbert's junior season is highly anticipated — by Ducks fans and, apparently, by NFL scouts — the brain under that Brenden Schooler-inspired hair is what coach Mario Cristobal first mentions. "He can fix you," Cristobal says, explaining that the 20-year-old biology major now understands football well enough to confidently change from a bad play call to a better one. "Justin understands the run, the pass game and particularly the protections to get us in the right play when we have to," Cristobal says. "When a quarterback can do that, it becomes another level of football for your offense" in terms of expanding the playbook. There are questions about who will emerge as reliable pass catchers and ball carriers for that offense. But Herbert's pedigree as a third-year starter whose name can be found near the top of award watch lists and mock NFL draft boards is the biggest reason for the optimism percolating a year after Oregon finished 7-6 under one-year coach Willie Taggart. Herbert says the return of offensive coordinator/quarterbacks coach Marcus Arroyo and the addition of veteran offensive coach Danny Langsdorf as a special assistant give the offense a chance to fly in 2018. "Instead of starting fresh, we get to build on what we did last year," Herbert says. His 8-7 record in two seasons might not turn heads, but Herbert's arm, poise and competitive instincts have been evident since he led a game-winning drive at Utah in his sixth start for a 2016 team with a porous defense. 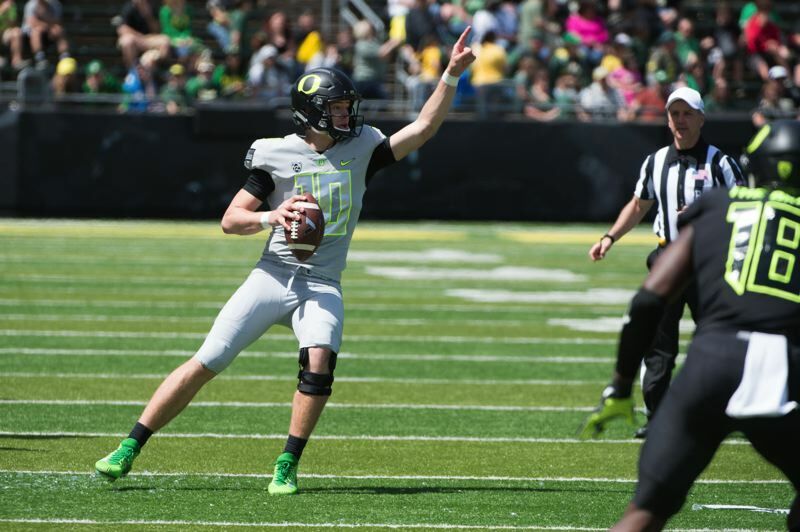 As a sophomore last season, Herbert threw for 1,983 yards, with 15 touchdowns and five interceptions. The Ducks won six of the eight games Herbert played. They were 1-4 during his absence with a broken collarbone. "I found out how much football meant to me, just watching from the sideline and doing as much as I could," he says. "Just to be out here with the guys and with the coaches, it's special. I try not to let any day go by that I'm not thankful for." At 233 pounds — eight pounds more than his listed weight as a freshman — the 6-6 Herbert looks like he's grown significantly since arriving on campus as a little-hyped QB out of Sheldon High. He was among the leaders of this offseason's ballyhooed strength, flexibility and conditioning program under the direction of new football strength and conditioning coordinator Aaron Feld. "Our bodies are in better shape to go through this fall camp," Herbert says. "He's a machine out there now," says junior tight end Jacob Breeland, adding that Herbert has the build to play tight end. "I worked out with him over the offseason and he was putting up some good weight. He's gotten strong, bigger. He's looking like an animal." Herbert hopes his added strength will improve his durability. But he is more excited to see the growth among the linemen who will be protecting him. "It makes me feel a lot better about just going for it," Herbert says. "With those guys around, not only are they huge, but they can move really well. Watching some of those guys run is really impressive." Dillon Mitchell, the Ducks top returning receiver, says he's noticed a subtle difference in his quarterback. "Justin has always had a cannon and doesn't need a lot of power to toss it 60 yards. But with the new fourth-quarter (training) program, I feel his accuracy has increased," Mitchell says. So has Herbert's ability to lead. Still humble and somewhat soft-spoken with the media, Herbert understands that delivering confident instruction to teammates is a necessity. "He doesn't mind speaking out now. He understands his role," Mitchell says. "He knows it's his team and it's going to go as far as he wants it to go."